I was sad to hear that writer Ursula K. LeGuin died last night. I got to meet her once, when she was GoH at a conference of the Mythopoeic Society, and found her to be as stunningly present and wise in person as on the page. Plus I was moved beyond words when she chose a piece of my art for the “Author’s Choice” award. But that was just a mild fangirl moment: her influence on me was much longer and stranger. We rarely get the chance to know and understand the influences we have had on the lives of others. You know? “That changed my life,” someone says, referring to some random statement or deed that you may barely even register or recall. Yet it turns out to have had a profound impact on them. This is just such a story. When I was in high school, I had the tremendous blessing to have gotten Joanne Burnett (also fondly known as “Burnie”) as my teacher for sophomore English. She had also founded the Tolkien Society, a haven for the brilliant weirdos who otherwise would likely have no home in high school society at all and may even have dropped out. Honor students who loved science fiction and fantasy: the skinny smart boys who knew every word to Monty Python’s routines; the musical genius girl who was put two years ahead and so was emotionally worlds away from most of her peers; and me with my untimely wild curly hair and braces on my teeth, a flowery vocabulary, and a noxious only-child combo of shy insecure artist with poor group social skills plus the costumed ego that attends a love of theater. She took us all in and gave us not only alternate worlds to inhabit, but a real-life community to go there with in a creative way that had us all laughing and reveling in our weirdness instead of drowning in it and then squelching it for survival. We built a dragon float for Homecoming, complete with steam that shot out in the general direction of the football team. One day, Burnie was teaching LeGuin’s short story, “The Ones Who Walk Away from Omelas.” It’s a story about ethics. It teaches insecure kids about the need to care about others. What greater lesson could there be? It made many of us into activists. That story, combined with Burnie’s political letter-writing assignment, made me feel politically empowered for the first time: able to contribute to making large change instead of just being a helpless victim of circumstance. This story, Omelas, moves her. She had taught it dozens of times already, but every time, she told me later, she had cried. This was no different. She got to the end, and not only teared up, she struggled to control her tears so much that she could not keep reading. Her head was down as she held the book loosely in her left hand and tried not to sob. You know kids. Adolescents struggle with their own turbulent emotions, so a teacher openly showing hers like that? Awkward. The class sat there semi-frozen, looking at her fixedly or darting glances at one another out of the corners of our eyes. Waiting for Ms. Burnett to pull it back together, the silence in the room grew uncomfortable. Too uncomfortable. My unwanted tears welled up other times too, when feeling helpless fury over other kids’ meanness, especially in groups; or at home, when considering the “duck and cover” training we were told would save us from nuclear attack, even though I couldn’t for the life of me figure out how cowering under a tiny school desk for awhile could help much. This duck-and-cover practice meant repeatedly confronting its inherent idea that we might never get to grow up. That we were all at the mercy of powerful men at the helm of our countries; men who might be, or get, mad enough to push that button. I understood that possibility as real, due to repeatedly experiencing Dean’s casual meanness. And when you look at the world that way, why would anything matter? Since we might never get to have a grownup life or career anyway, why not just read comic books and climb trees while you can? Why not savagely poke each other to the point of blood with your compass’ steel point in geometry class when nobody is looking? Why not just do anything you want while you can, and damn the rest of the world? Burnie’s lessons about social justice finally gave me a reason why. I mean one beyond the heart, which knew all along and had been crying for that; she offered a reason that I could articulate in order to then reason with others. So I thought her tears for injustice unspeakably beautiful. She dared to face the situation, which is the first stage of changing it. She faced it with not only her mind, but also with full, brave heart and spirit. And she was teaching us how, too. I didn’t want her to be put down for her open sensitivity like I had been. So when the feeling in the room began to grow too uncomfortable, I got up from my seat and walked to the front of the room, where I gently took the paperback book from her hands. Finding the last line she had read, I read it aloud again to orient everyone and then kept going with the story from there, reading it aloud for the class until the end. I then closed the book, quietly placed it near her on her table, and returned to my seat. Ms. Burnett looked up through her tears and smiled a thank-you. In a few moments, after blowing her nose, she pulled herself together enough to lead a moving discussion about the story and its lessons regarding what is truly important; about to best live as a full human being. Lessons that few high school teachers dare to touch, let alone from a place of deep personal authenticity. Deep, vital questions that can impact a student for life. The only reason I remember this story is that Burnie told it again numerous times over the years. How my kindness at age 14, in the face of widespread potential disapproval from my peers, had moved her. How that act had demonstrated, in a small way, the principles the story was trying to teach. Because of that story, I caught Burnie’s attention and eventually we became dear friends. This friendship lasted more than forty years, until her death a few months ago, and was one of the greatest blessings of my entire life. In my later teens and early 20s, it brought me a whole larger community of kind nerds, with whom I still remain emotionally close even though I now live in a different state. Burnie’s people-gathering skills spawned our own local chapter of the Mythopoeic Society as well as the first northern Nevada chapter of the Society for Creative Anachronism. She saved the brilliant weirdos like me, and I in particular have LeGuin, in part, to thank for it. Ursula K. LeGuin loved Taoism, as do I, and her themes often speak of the balance inherent in that philosophy (and in ecological reality). I’ll end this with my favorite poetic lines from the first book of hers that Burnie gave me at age 14 or 15. I still call upon it in times of need. May it serve you in turn. “The Ones Who Walk Away from Omelas” is a short story published in The Wind’s Twelve Quarters. Right now, you can read it as a PDF here. But please do yourself and her family a favor and go buy the book too. Or another one by her. My personal favorite by LeGuin is actually Buffalo Gals and Other Animal Presences. What is yours? Collared Sparrowhawk image courtesy of Wikimedia Commons. Image of Ursula K. LeGuin sourced from http://www.orderofbooks.com. Image of Joanne Burnett was made around 1980 by unknown source, perhaps the Wooster High School (Reno, NV) yearbook. is the thought that creates that reality. the seat of life and growth, which is the seat of quintessence. How unconscious most humans are, but that it can change! I uncovered some of my own self-defenses that keep me from action. The application of psychoanalytical theories to understand the great complexity of our environmental situation. I look at all that is around me a little differently now. Knowing it is all of the earth, and perhaps more importantly that it will go back to the earth, changes the way I operate in my days. How incredible these realizations have been for me. Awakening has been the most beautiful process I’ve ever endured. These are the truths that have become my mantras from being absorbed in ecopsychological concepts. These are incredible supports that I rely on when feeling distressed, confused, and at times, hopeless. I will continue to live mindfully in respect to nature. 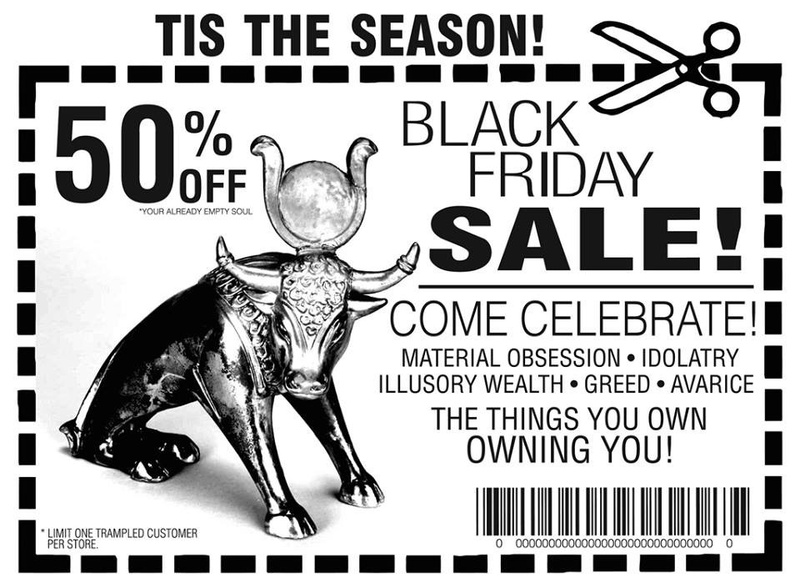 Being conscious about what I purchase, what I waste, how and what I eat etc. and share what I can with whoever will listen. Like candy for my soul. I composed this as a gift back to them, a lens on what happens in this program, and a reflection for teachers to turn to when times at work get rough. 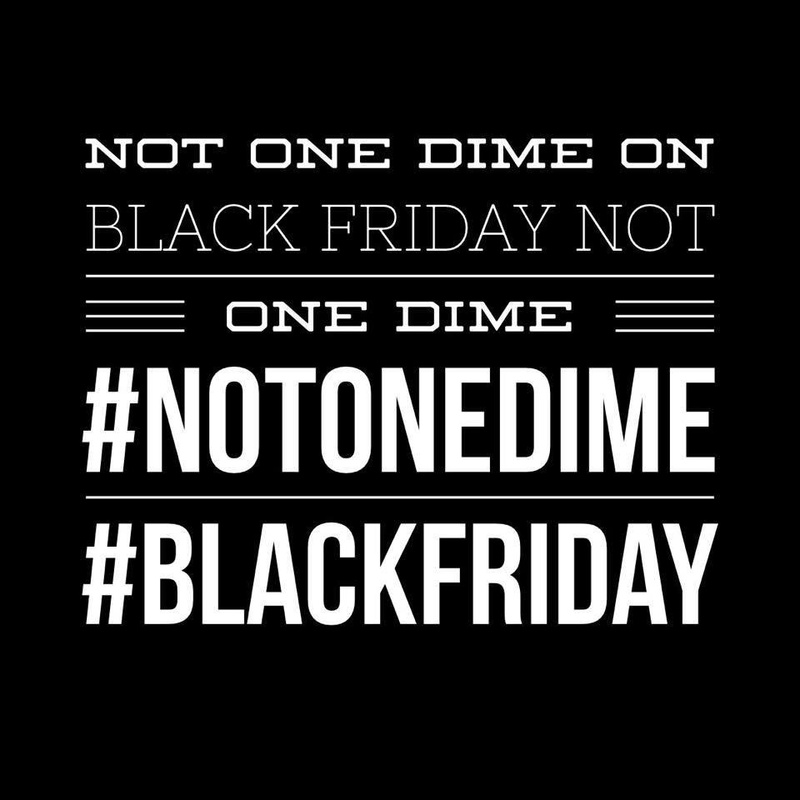 To help us remember that what we do matters. Students whose words are in here: Katie Poinier, Thompson Bishop, Melanie Gajewski, Colleen Kirkpatrick, Karen Delahunty, Lauren Mangion, Anne Gordon, Sierra Robinson, Erika Dearen, Bekah Turner, Tessa Stuart and Jakob Ledbetter. I am extraordinarily fortunate as a teacher, so often getting to feel awe at the depth of my students’ thoughtful engagement with their learning, their passionate desire to care for the planet, and most of all, their souls. Do you ever get the spine-tingling feeling that the more-than-human world is looking out for you? I went to make a drink the other night that involved ginger. In an attempt to save money, a week or so prior, I had made my own ginger tea (brewed from grated ginger root peelings left over from a meal in which I’d eaten the root itself). A small bottle of what I hadn’t yet used was kept in the fridge. I’m not a butterfingered person; I’m quite facile with my hands. I rarely fumble or drop things. But this day, as I went to pour some of the ginger elixir into my cup as the last ingredient, I knocked the cup over and its entire contents spilled out onto the counter and down on the floor. The ingredients are expensive, so I wasn’t happy with myself about this waste. Sighing, I cleaned it up, and then carefully made another. The same thing happened all over again – the ingredients poured out all over. I cleaned it up. And then it happened yet again. The third time, the bottle itself slipped from my fingers. What is going on? I thought. 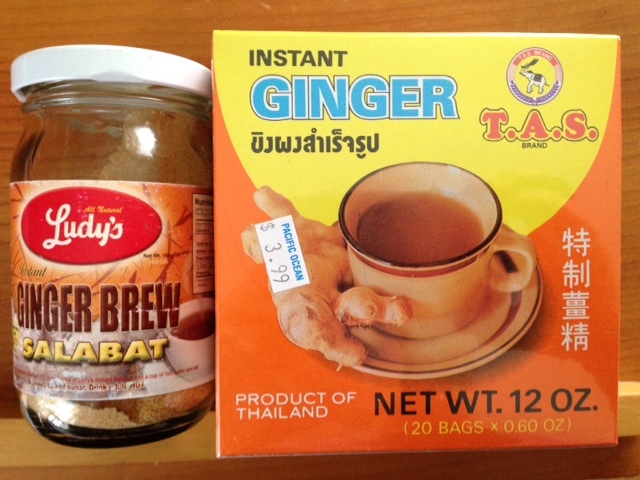 Then I looked more closely at the ginger brew. The bottom third of the bottle, which I had now reached, contained small puffs of mold. I sat down, heavily. Who knows what kind of mold this was, and what effects it might have had on my health had I unknowingly drunk it? Perhaps it would have been fine. But I suspect otherwise. When such things happen, a person has many possibilities for interpretation. Maybe I was just not paying enough attention to what I was doing. That happens. Or maybe my hands suddenly became clumsy due to some other factor. But three times? The event was so anomalous, and repeated three times like in a fairy tale! So I, an unrepentant animist, think the ginger was looking out for me. And I feel enormous gratitude over spilled drink. It’s the Autumnal Equinox as I write this, which the Christian church overlaid with a celebration called Michaelmas. 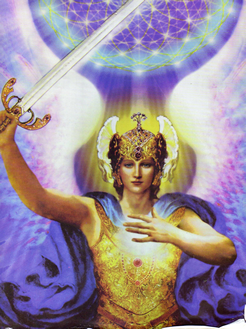 Archangel Michael, for whom Michaelmas is named, is known to serve as a protector. He’s actually appeared to me personally not only once, but twice, in hours of need. 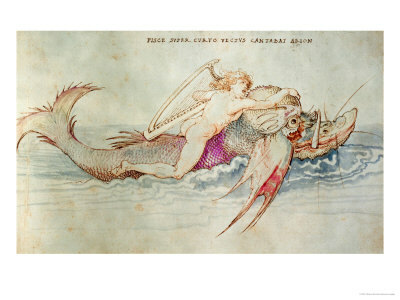 …Me, a pagan, who doesn’t “do” iconography of good vs. evil; neither devils nor angels. But that’s a story for another time. Some scholars have pointed out the parallels between Michael and the pre-Christian Irish god Lugh. At least Lugh is another form easily recognized as a holy agent. But the grand Archangel Michael in the guise of a hot yellow root?! I’m also reminded of the wonderful Greek tale of Philemon and Baucis, humble peasants who were visited in their home by beggars who turned out to be disguised gods. Their generosity with food and shelter to their unexpected visitors ultimately allowed them to live when the rest of the entire stingy village below got inundated the next morning with a covering flood. So there. Love these cautionary tales. Plus they got to live out many post-human-death years as entwined trees. The message is, you never know who you’re really dealing with. All of these serve as good reminders to treat the entire world as divine, particularly the humblest manifestations. If such stories speak true, sneaky godlings get a kick out of testing us that way. Boil it in water, and add a sweetener to taste. It not only tastes yummy, it’s good for soothing throats when you have a cold. In a medium-sized glass, squeeze 1/2 lime over 3 ice cubes and drop the peel in on top. Add one jigger of vodka. I hear that some people think a copper cup enhances the flavor. Never tried it myself. This drink is super refreshing in the summer after work. That lovely ginger root pictured at the top of this post was grown by my friend Hugh Johnson, a.k.a. “Biker Dude”. 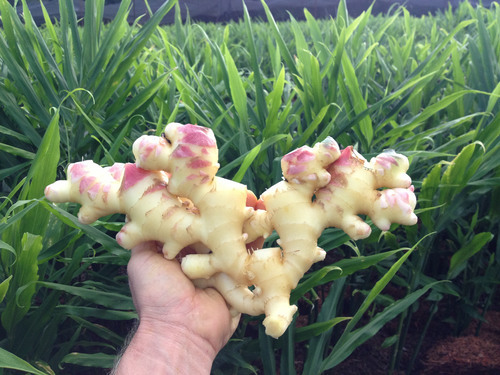 He runs the largest organic yellow ginger farm on the Big Island of Hawai’i. 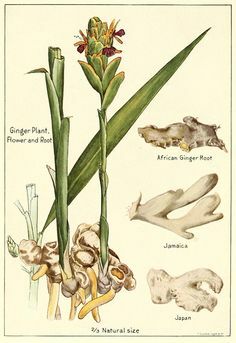 Chances are high that whatever organic yellow ginger you find in mainland grocery stores will be some of Hugh’s. If you buy ginger, please buy organic if you can. It makes a difference to your health, the health of the planet and the health of the farm workers. And do yourself a favor sometime: try organic yellow ginger. Mmm. Believe it or not, it’s really really good sliced raw on Newman-O cookies. At a recent contradance, my day was made when someone jokingly wondered how to say “thank you for the dance” in Klingon* – and someone else actually knew. Daniel Morse, who translates Chinese texts for a living, turns out to also be fluent in Klingon. Without batting an eyelash or pulling out a device, he explained the following. Ma = we together, Mi/t = dance, mo/= due to, or because of that, qatlho/ = I, to you, thank. Note his knowledge about grammatical structure differences between Klingon and English too. I was pretty surprised by the idea that Klingons dance, so even though I trust my friend, I did do a bit of Internet research for confirmation and maybe a scandalous video showing their moves. Indeed, many of these same words appear when calling upon Saint Google. Another juicy tidbit also arose: several scholars pointed out that while qatlho/ (I, to you, thank) is a Klingon word, it is not one used by Klingons. So what would Klingons say? “I’m sorry I didn’t stomp hard enough on your foot”? You know how interesting things often occur en masse? Around the same time I was delighting in this, applied Klingon language appeared in the news. An UFO was sighted in Wales, and a magnificently nerdy government spokesperson responded. 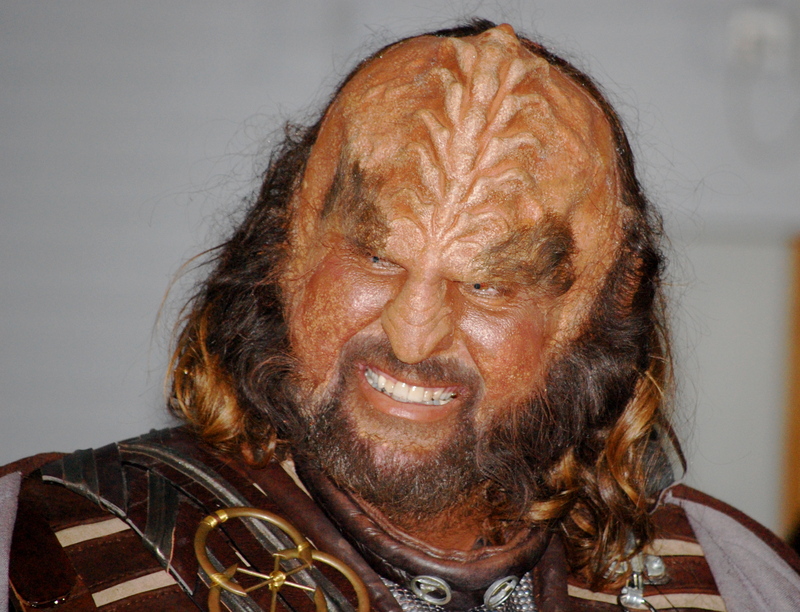 “Klingon was the chosen language for the Welsh government in its response to queries about UFO sightings at Cardiff Airport. While English and Welsh are the usual forms of communications in the Senedd, it opted for the native tongue of the enemies of Star Trek’s Captain Kirk. 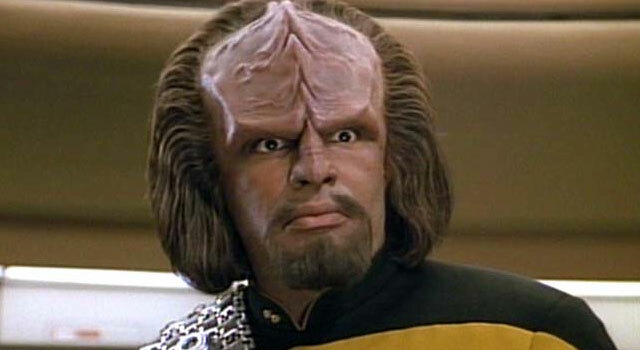 It is believed to be the first time the Welsh government has chosen to communicate in Klingon. Mr Millar, shadow health minister and AM for Clwyd West, submitted three questions to economy, science and transport minister Edwina Hart about UFO reports around the airport and across the rest of Wales. Click here to read the full account. See, I didn’t make this up. The crazy late night search for Klingon dancing terms gave me another moment of linguistic delight before going to bed: there is actually a site dedicated to informing people how to say the vital phrase, “My hovercraft is full of eels!” in multiple languages, from Afrikaans to Zulu. As if this homage to the bad Hungarian phrasebook in Monty Python’s Flying Circus weren’t enough, as a bonus, the wizards at Omniglot include the phrase in several invented languages – yes, including Klingon. …I suppose they’re also no weirder than a search for how to say this phrase in the first place. Or to praise your dance partner in Klingon. Ah well. Thanks for reading. * For the non-nerdly among our readers, “Klingon” refers to a fictional alien (planetary alien) people and language from TV’s Star Trek. This is a picture I took at an arts and crafts supply store — in September. Halloween decor I could handle when it was still 70 degrees out and school was just getting started, but Xmas stuff too?! “Beware the horror” indeed! 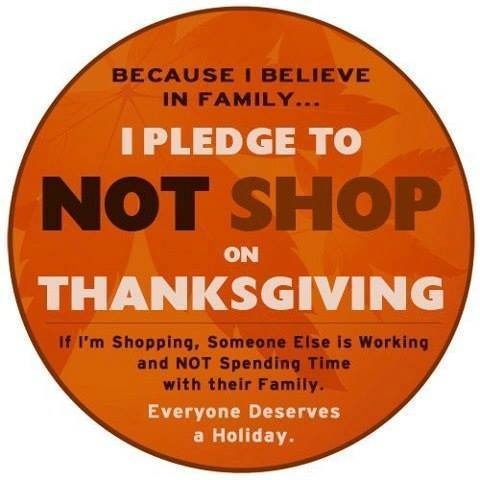 Now it’s Thanksgiving Day as I write this, and the onslaught really begins. Do you feel your body recoiling at the barrage of ads, tinny Rudolph Midnight Clear muzak, the message that you have to now get busy and jolly and go shopping? Yeah, me too. So I have a proposal. 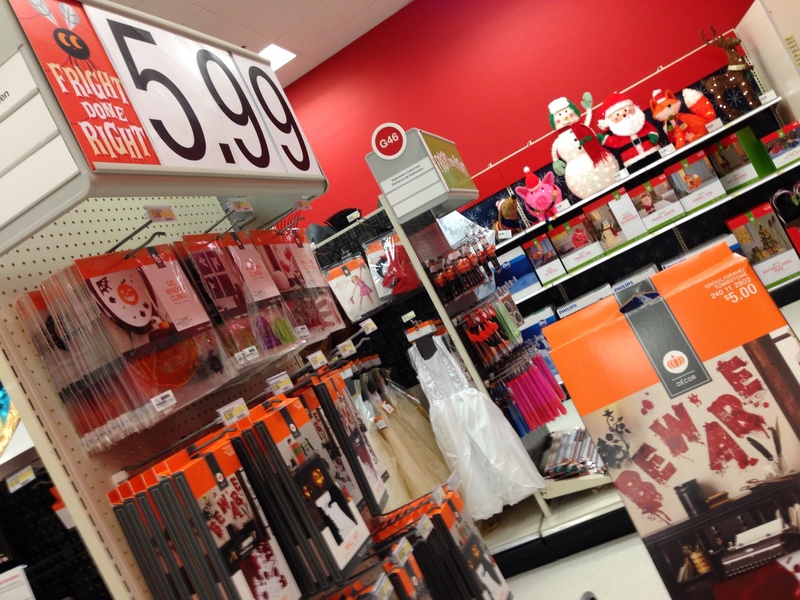 Instead of rewarding the Christmas sales juggernaut that now begins before Halloween (argh! ), let’s switch it up. Slow down the holidays. Enjoy the one we’re in. 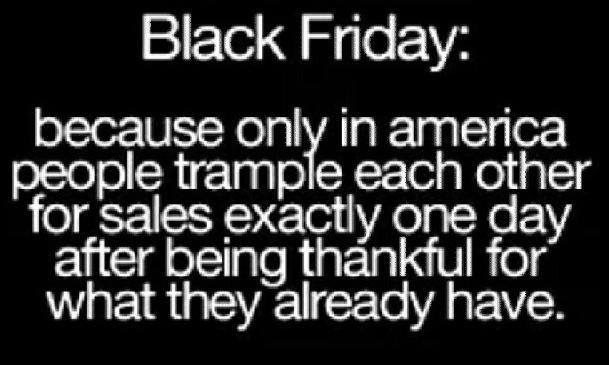 I propose a movement to keep actively ThanksGiving for the last few days of November, enjoying and appreciating what we already have instead of buying. If taken up en masse, this could be revolutionary. Enjoying and appreciating what we already have instead of buying – if even for a few dedicated days. Here are some memes for inspiration. The last one is my favorite. * I found the above memes being passed around the Interwebs. If you made one of them, please let me know so I can give you credit. There are many old tales of animals helping humans in marine settings — dolphins aiding swimmers off the coast of Greece, and seals herding schools of fish toward boats in the small islands of the British Isles. Here follow two recent heartwarming tales of interspecies aid and kindness going the other way. In which a Number of Buck Deer Hitch a Boat Ride with Alaska Quest Charters, and are Not Even Charged Passage. Four young black-tailed bucks swimming in Taku Inlet last October got in trouble when the winds came up, whipping the waves high and making the water freezing cold. As they shivered and lost energy and the threat of drowning from exhaustion and hypothermia became a real possibility, along came Tom Satre’s charter vessel. Uncharacteristically, these wild animals made straight for it. So they did what they would have done for a person: they helped the four young bucks aboard and warmed them up. To get their chilled blood running again, the humans gave them massages! Once the vessel landed, since the bucks were still too chilled to walk, the people carried them in wheelbarrows to safety on shore, waiting until they could stand and make it into the woods on their own. How beautiful that these deers’ need was met in such a caring way! You can read the full story and see a lot more pictures on Alaska Quest Charters’ website. In December 2005, a 50-foot female humpback whale was likely enjoying another day of swimming along the usual migratory route, when she got tangled up in a knot of nylon ropes that link crab pots together. A crab fisherman spotted her. Soon the captain of the whale watching/shark diving vessel New Superfish and other volunteers from the Marine Mammal Center were on their way. [The diver] Moskito said about 20 crab-pot ropes, which are 240 feet long with weights every 60 feet, were wrapped around the animal. Rope was wrapped at least four times around the tail, the back and the left front flipper, and there was a line in the whale’s mouth. The crab pot lines were cinched so tight, Moskito said, that the rope was digging into the animal’s blubber and leaving visible cuts. Evaluating the situation, they realized the only way to save the whale would be to dive into the water with her and cut the ropes.This would be a very risky maneuver, because a single flip of the humpback’s massive tail could kill a person. Moskito and three other divers spent about an hour cutting the ropes with a special curved knife. The whale floated passively in the water the whole time, he said, giving off a strange kind of vibration. When the whale realized it was free, it began swimming around in circles, according to the rescuers. Moskito said it swam to each diver, nuzzled him and then swam to the next one. After describing his experience, it seems as though Menigoz may have suddenly worried what folks enmeshed in the industrial growth paradigm, where only humans get to claim consciousness, would think. Or perhaps the experts or reporters gave him the hairy eyeball. 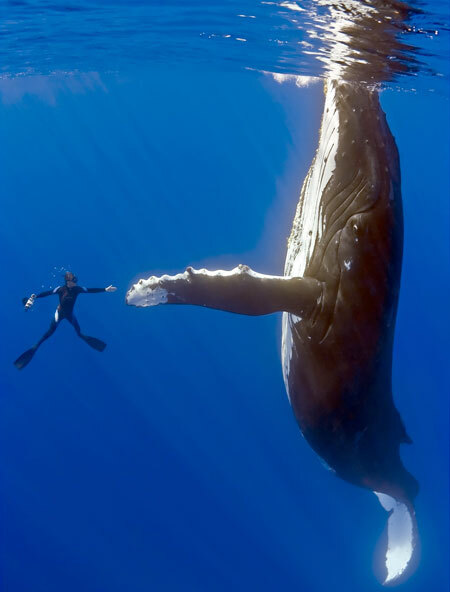 Whale experts say it’s nice to think that the whale was thanking its rescuers, but nobody really knows what was on its mind. According to the Marine Mammal Center, this was the first time an entangled humpback was successfully freed on the West Coast. The moving photo that has so often been paired with it is just as real, but according to Snopes.com (the best urban-legend debunking site ever), it shows an encounter that took place nearly four years later, between another (?) 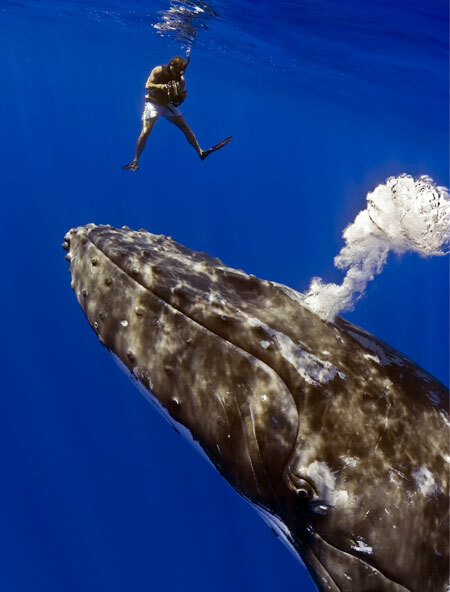 50-foot female humpback and photographer Marco Queral in the South Pacific. Both photos here in this post show the two of them. May we continue to hear of many more such episodes of interspecies aid and kindness — going both ways.